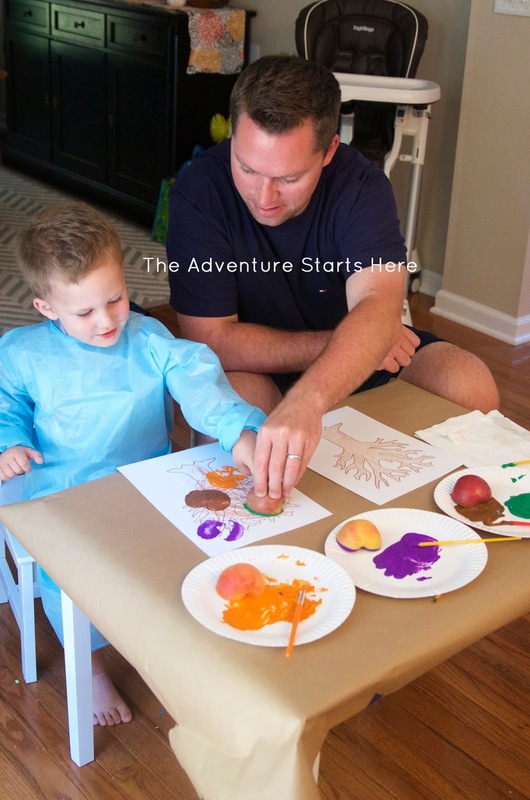 Now that fall is here, I have so many crafts I want to with Noah! I search Pinterest for ideas and then take a screen shot of the crafts so I have them handy in my camera roll. And while this might sound crazy, in order to get them all done, I actually schedule them on my calendar. I figure September will be all about the "fall" crafts and then we will move onto Halloween in October and turkeys in November. 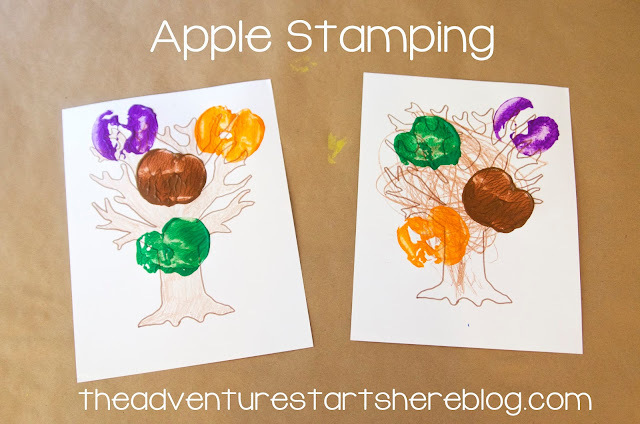 I loved the idea of using apples as stamps. You could use this stamping technique in so many different ways. I've seen people use citrus fruits and you could also get fancy and cut into potatoes and stamp some jack-o-lantern faces! We kept it super simple and just cut some smaller macintosh apples in half. We picked quite a few macintoshes at the farm and then found out that they weren't Noah's cup of tea. So we did the next best thing and used them to craft! 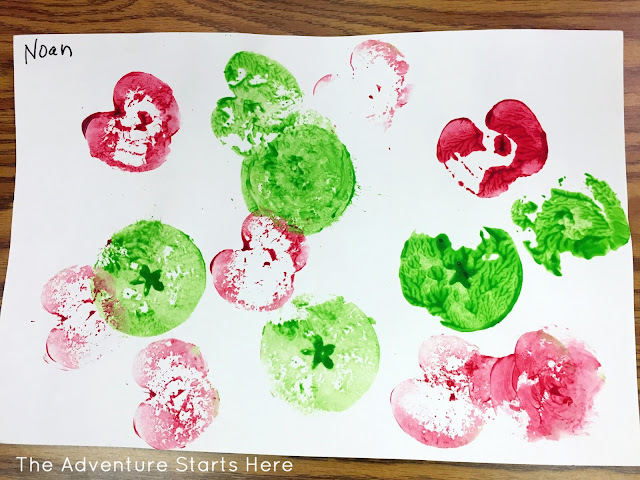 I found the tree template here and printed out a few copies on card stock (I prefer using the thicker paper when painting). 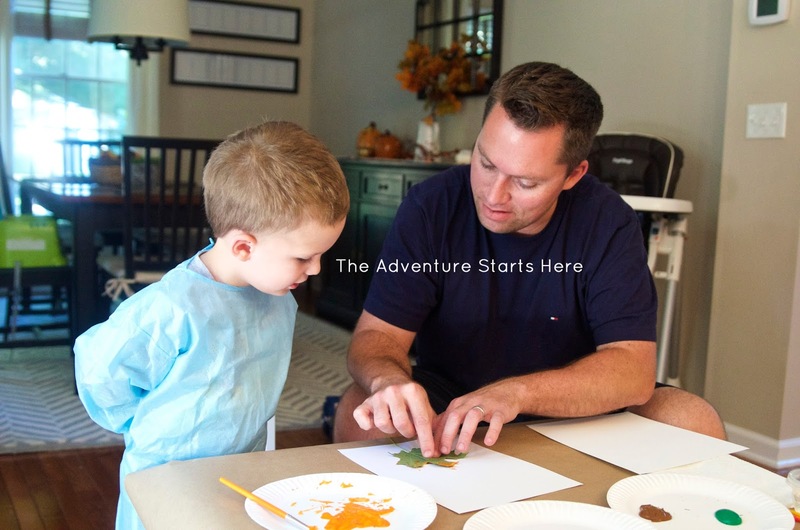 We colored the trees with crayons and then Noah picked out the paint colors he wanted to use for the stamping. 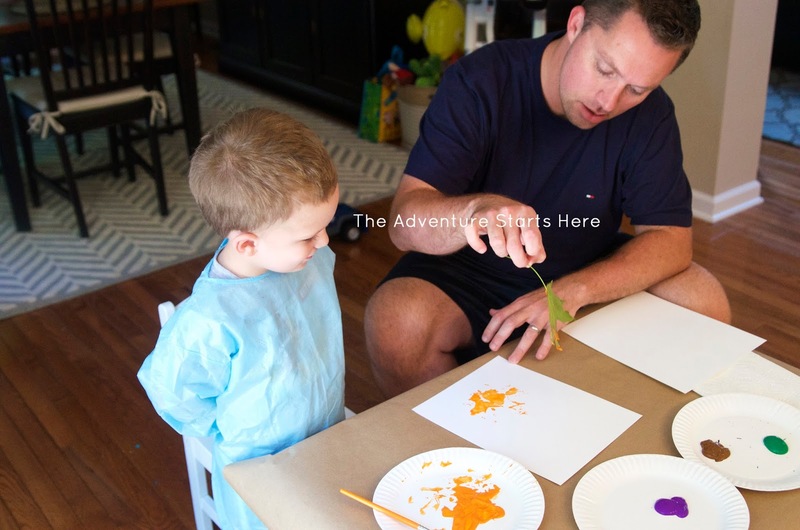 I find it amusing that Noah chose purple instead of the typical fall yellow or red... it really makes his artwork unique! I am going to give this apple stamping a try! I think it would be a good way to use apples that are on their way out, too! I love how you craft so much with Noah. haha! love that you save the crafts to your camera roll because that is EXACTLY what I do too!!!! I also save them so that Lily can see a picture of the finished project if it is "that" kind of activity. How do you save them in your calendar? Just manually enter them? Did ya'll use acrylic paints or what kind? Ok, no joke, you are seriously like the craft queen! I hope you are posting all of these on Pinterest for others to find because... genius!! !